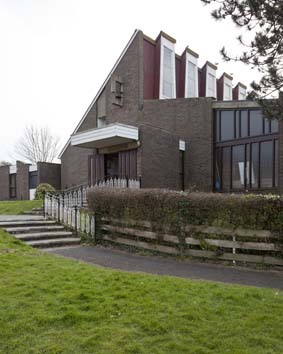 A mission church was opened in 1936 in an iron church donated by the church of the Good Shepherd, Dyke Road, Brighton (ESRO Par 519/7/1/1); this stood on the site of the present church carpark. The dedication was no doubt intended as a gesture of thanks. This served until Clayton, Black and Daviel designed a permanent one in 1967 (ibid). the responsible architect being M G Alford (BE(E) p278). It is built of brick, dark outside and light inside. There are two parts, consisting of a low western one with a sloping roof and a taller one with a steep roof that rears up with long vertical windows in white frames. 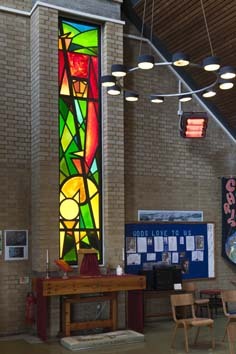 The aim was to allow as much natural light as possible to fall on the altar, which is placed against the long east side. Above the main north entrance a concrete bell-frame projects. The roof inside has pierced iron girders and though the altar is clear of the east wall, there is no central plan, unlike Roman Catholic churches of the period. 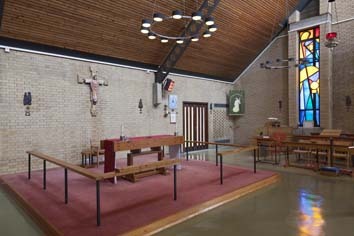 The fittings are unobtrusive and mostly new, but a few, like the crucifix behind the altar, were retained from the temporary church. and the only colour comes from the glass in the side-windows. 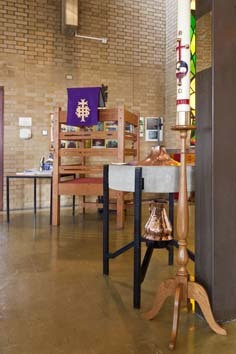 The church became an independent parish in 1994. Glass: (North and south sides, first windows) K Budd (Elleray (2004) p45) abstract.